The MiFID II ancillary activities tests must be calculated for each separate person who trades in commodity derivatives within a group, said the European Commission on 31 May 2018. Is it good or bad, someone may ask. It depends, lawyers usually answer. Internal policies must “define a priori“ the types of OTC derivative contracts included in the hedging portfolios. Is it possible, then, to change the portfolios allocation after the trade was reported under EMIR and MiFID II? Positive answer to this question may add some value to OTC derivatives trading strategies. It is difficult to capture all legal requirements with respect to transparency of the systematic internaliser’s quotes and transactions at a glance. Firstly, the pre-trade and post-trade issues must be differentiated. - shares, depositary receipts, ETFs, certificates and other similar financial instruments, on the other. If to concentrate on products like bonds, structured finance products, emission allowances and derivatives firstly, it occurs that to determine transparency obligations we must separately analyse not only clients of the systematic internaliser and other market participants but also different categories of clients of the same systematic internaliser. Liquid and illiquid markets have their specificities too. To decode the respective requirements the diagram recently revealed by the ESMA is much helpful. 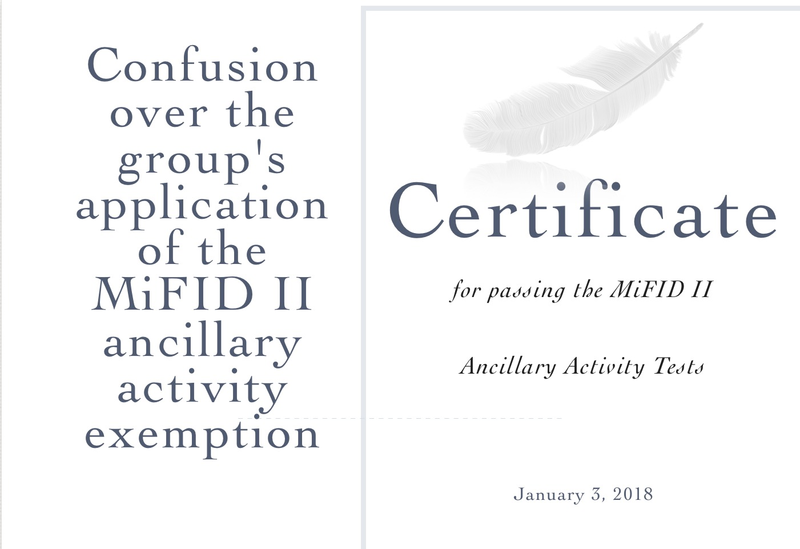 Complicated nature of MiFID II is expressed, inter alia, by the fact that given OTC derivative contract can be, concurrently - under the same MiFID II Directive - equivalent and not equivalent to the on-venue products. This is not only the theoretical, cognitive disharmony but impacts directly on the scope of the trading position that can be taken in the derivatives market. 2. you are not required to monitor the position limit compliance of your clients. Annex to the ESMA's opinion decides whether any derivative contract concluded on third-country trading venue is covered by the EU position limits regime. The European financial market's watchdog has updated on 31 May 2017 its Q&As on position limits framework under MiFID II. The update relates to the ESMA's answer to the Question No. 2 (the original version thereof was issued on 19 December 2016) and deals with the problem of defining a lot in derivatives where the underlying asset is electricity. It is clear now that according to the EU financial regulator opinion the first notification under Article 2(1)(j) of MiFID II must be made by January 3rd of 2018. Given that the calculation period to be covered by this notification includes also the year 2017 it is quite astonishing. The objective lack of credible market data necessary to be aggregated in the calculations for the purposes of the above notification also did not prevent the regulator from requiring of market participants to do the impossible. OTF's discretionary order execution - a cause of concern? Lower costs of collateral, direct access to the settlement system - all this due to the so-called "REMIT carve-out" - make the OTF (Organised Trading Facility) particularly interesting trading opportunity in the EU energy wholesale market under MiFID II (starting as from 3 January 2018). The underlying fact is that physically-settled instruments covered by REMIT (wholesale energy products within the REMIT terminology - mainly electricity and gas) traded on an OTF do not qualify as MiFID II financial instruments and are consequently outside the scope of MiFID, EMIR and the CRD IV package. However, while regulated markets and MTFs have non-discretionary rules for the execution of transactions, the operator of an OTF carries out order execution on a discretionary basis subject, where applicable, to the pre-transparency requirements and best execution obligations. The way the discretion will be exercised by the OTFs operators is the most troublesome element, the regulators, market participants and the OTFs themselves currently intensively consider.